Her room is located on the second floor of The Grey Mare, second door on the left, and she will sleep there every night between midnight and 8am. After waking up, she heads up to the plaza surrounding The Great Oak, which happens to be the address of the Chorrol Mages Guild. Here, she will wander around all day, seemingly taunting Teekeeus with her presence, while chatting to the other citizens. She only breaks off at 1pm to enjoy a three-hour dinner back at the inn. The exception to this routine happens during the related quest but only if you decide to deliver Fingers of the Mountain to her first. As soon as you hand it over, she will head back to her room at the inn and place the book in her locked chest. Once the book is secured, she will stay in her room for the rest of the day until she heads to bed at midnight. Starting at 8am the next morning, she will wander around The Great Oak as usual but will skip her lunch, eagerly awaiting to tell you of her discoveries. During this stage, she will only return to the inn to sleep between midnight and 8am. As soon as you have spoken with her, she will return to her regular schedule. When you meet her for the first time, before having joined the Guild, she will be patronizing and reject you with the words: "You're a bold little thing, aren't you? I'm afraid you're of no use to me. Goodbye." And she will keep that attitude towards you all the way through the quest, even though you're helping her: "Be a dear and fetch me that book like I asked. Hurry along now." and "Well, if it isn't my little helper. Have you retrieved that book for me yet?" To match that attitude, her wardrobe is pure upper class: a green brocade doublet along with a green silk garment and a pair of green velvet shoes to match. She carries nothing but a considerable sum of gold. She knows a high leveled set of mage spells from all schools of magic. As expected, the reasons behind all the hatred between Earana and Teekeeus intrigues most of the residents at the local guildhall. Apparently, Angalmo ran into her downtown and will tell you that: "I passed her the other day. You wouldn't believe the look she gave me! Whatever happened, she's taking it out on the whole guild." Also Contumeliorus Florius has heard of the bad blood between the two: "I'd steer clear of her if I were you. She has it in for Teekeeus, and wouldn't hesitate to take any of us down with him." Alberic Litte seems to have a bit more background knowledge: "She's nothing but trouble. She went to the University long ago, but was expelled from the guild. Caused all kinds of trouble while she was there. I think Teekeeus was the one who finally blew the whistle on her. That'd be just like him too; always playing by the rules." While Athragar has a new angle to the story: "I don't know all the details, but I heard that she complained to the Council until they removed Teekeeus from his position at the Arcane University." If you ask Teekeeus, he will tell you the following: "She and I have an unpleasant history. She does not care for Guild regulations, and errantly believes I am mis-using my powers. I have seen that she is in town. Though she has not approached me, I know she wants something. I would like you to find out what it is. Determine what she's after, and how we may be rid of her. I do not want her here, spreading her lies." Earana, however, sees things differently: "I'd have a few choice words for him, but he won't let me get near him. I know exactly why he's so threatened by me. He's desperately trying to control as much power as he can, and I'm a threat, because I don't want to see that power all in his hands. Anyone capable of handling it should have access to that power, don't you think?" And not surprisingly, Teekeeus will disagree: "She is a scavenger, and has no respect for the power of the Arcane arts. She has no business here, and I will not aid her in any way. I highly suggest that you make no effort to associate with her." If you choose to give the book to Teekeeus, only to steal it from his chest afterwards and then deliver it to Earana, she will keep it in her inventory indefinitely. 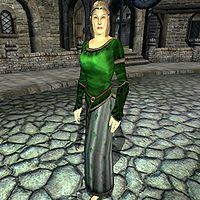 If you are expelled from the Mages Guild during the Fingers of the Mountain quest, she will talk to you as though you've never met. Esta página foi modificada pela última vez à(s) 08h17min de 28 de dezembro de 2015.